BMW is a company associated with motoring firsts. The very idea of a sports sedan was merely a novelty until BMW introduced the 5 series in 1972. As BMW's ""middle child,"" the 5 series has featured from the company's smallest and largest models, with the e12 M535i being the first car after the e26 powertrains and other equipment M1 to wear the ""M"" badge. 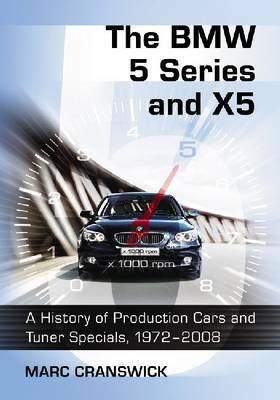 This book covers the history of BMW's 5 series midsize sedan and X5 SUV from September 1972 to the e60's major makeover for 2008 and the recent development of the e70 X5. Specific mechanical, electronic and cosmetic changes are described, including the time of and reasons for their introduction. Several aspects of BMW's corporate history and technically related models such as the 6-series are also described, as are aftermarket modifications by Alpina, Hartge, and other low volume specialist BMW tuners and speed shops. The book includes more than 200 photographs, along with an extensive index covering BMW technical innovations and listing all model variants by number ID, model ""e"" code, and production dates.